Find Condo and Townhouse Communities in Morris, Union, Essex, Somerset County, New Jersey by Location and Neighborhood. Click on the various Markers in the Map below to learn more about each Community. Also see: Find a Full List of Morris, Union, Essex, Somerset County Condo and Townhouse Communities. If you have any questions or need more details, please Contact Us, The Condo/Townhouse Experts in this area. * Partial Map, More Communities being mapped soon. List of Condo/Townhouse communities in Morris, Union, Essex, Somerset County by Town. If you have any questions or need more details, please Contact Us, Our Team has a Division that focuses on Condo/Townhome Sales and we are The Condo/Townhouse Experts. 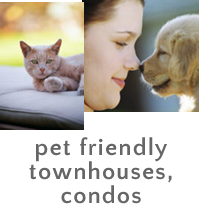 We understands how important your special companion can be and will help you live the Townhouse/Condominium lifestyle that best suits your needs and the needs of your special pet. As pet lovers ourselves, we have a unique understanding of you and your pet’s desires. Morris, Union, Essex, Somerset County has some of the most beautiful parks, some of them especially designed so your pet can safely exercise and play with friends. Many Morris, Union, Essex, Somerset County Townhome and Condominium communities have designed their facilities with your pet’s comfort in mind. Whether you are interested in existing townhouse communities or new construction, we can help you with you and your pet's needs. Almost all new construction is including pet comfort facilities in their design plans. Our Team will find a place both you and your pet will love. Contact Us today.